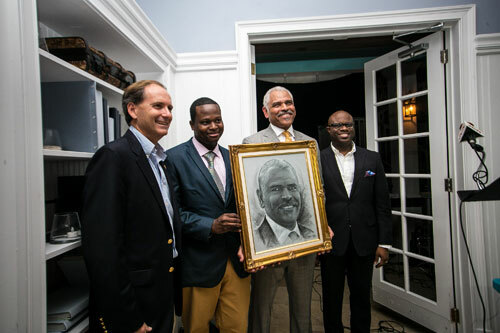 Impressing a man like Arnold Donald, 3rd from left, one of the 50 most influential black executives in America, isn’t simple, but celebrity artist Jamaal Rolle, 2nd from left, did it with this image of the man he had never met before. Also pictured is Chamber Chairman Robert Myers, left and CEO Edison Sumner, far right. Donald’s visit to The Bahamas, along with other Carnival execs, was arranged by the American Embassy. Donald used the occasion to remind the audience and media of the company’s role as the number one provider of visitors to the country – including 95% of all cruise passengers to Grand Bahama and 65% to Nassau, but he also urged care and attention to costs, security and overall visitor experience. Recognized as one of the top 50 most influential black executives in America, Donald got his first taste of the cruise business as a passenger as a young man and after heading up numerous other successful businesses and serving on presidential, hospital and university boards, took over the reins of the world’s largest leisure cruise business in June 2013 from Micky Arison who continues as chairman. 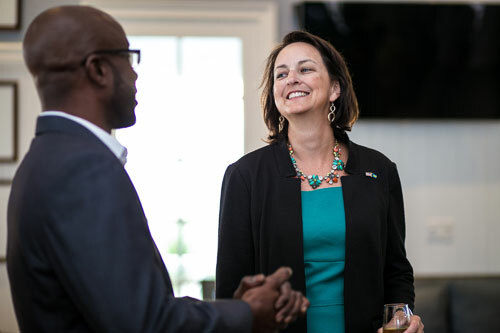 Sponsors for the event included Bahamas First, BTC, Callenders, John Bull, NUA and Palm Cay. BTC President Leon Williams, who also addressed the crowd, announced the telecom company would soon introduce mobile TV.